This programme is aimed at those wishing to pursue a qualification in marketing that is relevant and current. Previous students include people from a range of business and marketing backgrounds. As a part-time programme it is flexibly delivered and is a manageable complement to a busy professional life. This programme places heavy emphasis on the strategic know-how required to be successful in marketing. Though Digital tools and techniques remain the focus throughout, the value of integrated campaigns is a feature. The programme design reflects this. In the earlier part of the programme students will explore the key skills required for navigating the various platforms and tools. Through elective choices students can develop a mastery in various areas including SEO, Analytics, Consumer Behaviour and E-commerce. Programmes such as this are well designed for online delivery. Digital literacy is best developed and enhanced in the environment in which it is to be practiced. Live and recorded content allowing for meaningful interaction with fellow students and lecturers is a cornerstone of our lecturing approach on this programme. Thus, participants experience the benefits of various types of learning in an environment that is conducive to busy lifestyles. What does a Marketing professional do nowadays? Marketing has changed utterly over the past 15 years with many companies very unsure of themselves. Knowledgeable talent on the marketing team is what can make the difference between success and failure. It is now no longer sufficient to rely on external agencies and occasional training for digital marketing expertise - businesses need to develop their in house expertise and rely upon it for furthering their own goals. For marketing professionals to be effective they need to understand tools and platforms. This is ineffective unless they also understand strategy and positioning. By the end of 2018, 1 in 3 US households and 1 in 4 European Households will have a stand-alone voice enabled speaker. Voice will be the next battleground for SEO. Clothing and footwear is the fastest-growing segment of online sales. Ecommerce is pushing hard into products that were traditionally dominated by the high street. Facebook MAUs (Monthly Active Users) grew 11% in Q2 2018 compared to a year earlier – or to put it another way 5 new Facebook profiles are created every second. Reports of Facebook’s death have been greatly exaggerated. Our lecturing team has extensive and current industry experience at various companies including Google, PaddyPower.com and various other large international organisations. 250 students have completed part-time digital marketing programmes with CIT in the past 3 years. Many identify our programmes as having a significant impact on their careers. Social Media: We have an active and engaged online community which shares best practice and tips through various means including the #DMCIT hashtag which we have used over recent years. Practical assignments: All of the assessments on this programme are practically oriented. There are no terminal examinations with assessments often focused on reports and live cases. A live case is where a student's work on a real-world problem in conjunction with a company. CIT’s Marketing programmes are well known for this approach. Professional Development: One module on this programme is focused entirely on professional development. This is a useful outlet to consider one’s own development with respect to career. We emphasise the value of networking as a means to progressing knowledge and ability. 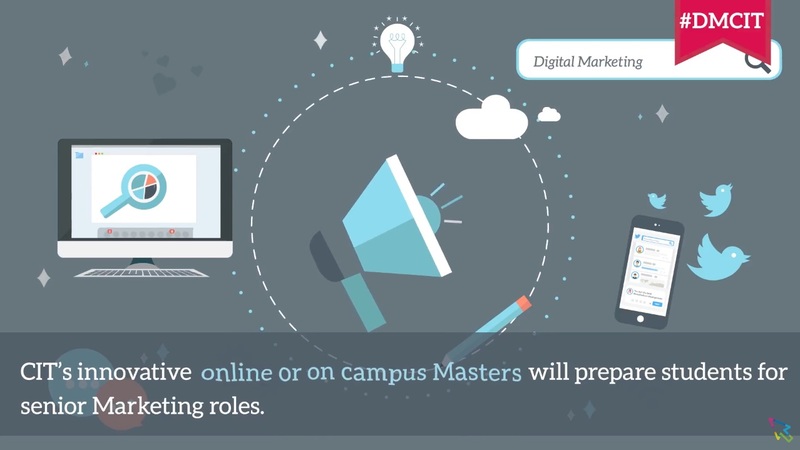 Admission to the Master of Science in Digital Marketing Strategy programme is based on a combination of an online application form and a short interview process. Candidates ideally should have attained at least a H2.2 degree in a cognate area (an area related to business, media or visual communications). EU Students: €7,500 – paid in 1 instalment of €1,500 and 3 instalments of €2,000 during the 2-year period. Non – EU Students: €7,500 – paid in 1 instalment of €1,500 and 3 instalments of €2,000 during the 2-year period. Please note that a deposit of €400 must be paid to secure your place on the course. The course modules are listed below. For detailed module information please click here.